Peggy Savage is ASHA's Membership Relations Manager. She's also a fabulous baker and the proprietress of Savagely Good. I'm a fan of her midnight orange fudge and her lemon bread is just like my grandma used to make. Peggy experiments a lot with food. She's fearless when it comes to things like tofu and swears you can make a wonderful frosting with pureed dates. 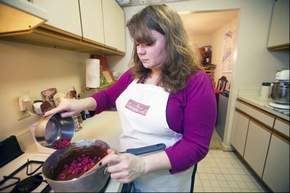 She often cooks in a Forks Over Knives style following a plant-based diet. She agreed to share a couple of recipes that will curb your sweet tooth without leaving you feeling all guilty for indulging. You can learn more about Peggy and Savagely Good in this article about her in the Fairfax Times which includes her lemon bread recipe. You can often find her at the Vienna farmers market on Saturday mornings. My boyfriend came home one day, after being stuck in Whole Foods during a huge rainstorm, and announced that he wanted to eat primarily vegan food. To pass the time, he read and then purchased a book by Dr. Joel Fuhrman about the many health benefits of a plant-based diet. I wasn’t too happy because I was never very interested in vegan food, but I have to say that I was also intrigued. I love to cook and even have my own business of my homemade goodies. However, I make things like fudge, salted caramels, cakes, and pies. Things that make you happy – if not terribly healthy! I do like a challenge so I decided to try a lot of different kind of vegan recipes and cookbooks. Along the way I found things I liked and things I didn't - black bean brownies are not good! The recipes I liked the best were in the companion to the “Forks over Knives” documentary, which is available on Netflix streaming. ASHA featured the documentary last year but I never had a chance to look at it. If you don’t know the ideas behind the documentary it is that you can change your health and overcome chronic health problems through diet instead of surgery. The book I recommend is Forks over Knives-the Cookbook. They support a low-fat, plant based diet of whole foods. You should also avoid processed foods. I’m not a fan of processed foods anyway and I love most fruits and vegetables so it wasn't too difficult to follow. I still eat meat and animal products but I almost exclusively cook vegan at home. The savory recipes are tasty but what interested me most was the section on desserts (hello - I make award-winning fudge!) I have tried a number of them and have been very impressed. My boyfriend has a tremendous sweet tooth so I try not to keep much of the bad stuff in the house. He can eat these things and not feel guilty. I should add that neither one of us eats very much of the goodies we make to sell, maybe it is because we taste test everything and that satisfies our cravings. I want to share two of my favorite dessert recipes from the book. These treats make you happy and are pretty healthy. They use whole grains, fruits, nuts, flax seed, and even chocolate. Chocolate is a health food, you know. These cookies are so yummy that I have to hide them so we don’t eat them all immediately! In a large mixing bowl, use a strong fork to beat together the applesauce, almond butter, dry sweetener and flaxseeds. Once relatively smooth mix in the vanilla. Add in the oat flour, baking soda, and salt and mix well. 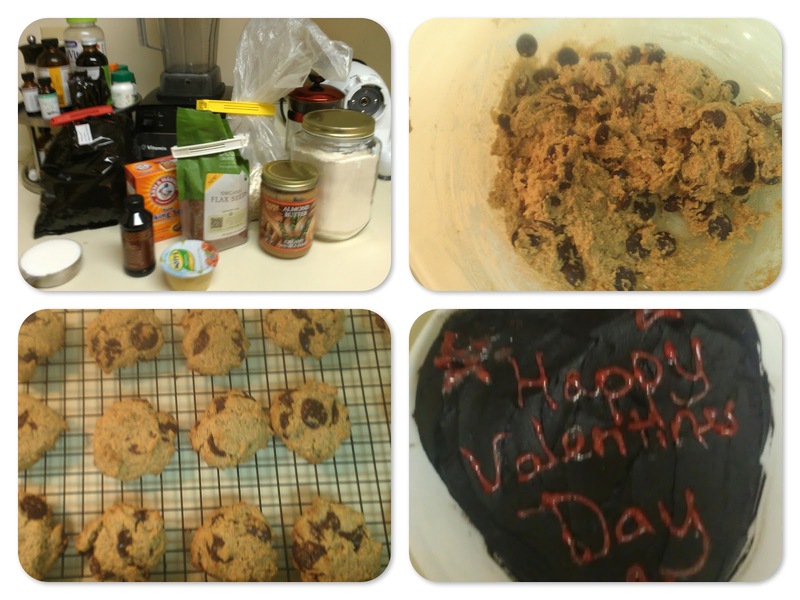 Add the whole wheat flour and chocolate chips and mix well. Drop the spoonfuls of batter onto the prepared baking sheets in about 1 1/2 tbsp scoops, about 2 inches apart. Flatten the cookies a bit, so that they resemble thick discs (they won’t spread much at all during the baking). – I use the bottom of a glass dipped in water so it doesn’t stick. Bake for 8-10 minutes. Remove from the oven and let them cool for about 5 minutes before transferring to a cooling rack. I’m not usually a fan of chocolate cake because they tend to be dry. This is one is most and seemingly very decadent. I even made it for Valentine’s Day. This recipe is adapted from the double chocolate cupcake recipe. I just pour the batter in a square 9” x 9” inch pan. If you want to have them as cupcakes, it makes 12 of them. Preheat the oven to 350°F. Spray a 9” x 9” inch. Melt the chocolate in a microwave. Let cool slightly. In a large bowl, whisk together the plant-based milk and vinegar. Let it sit for a few minutes, until curdled. Stir in the dry sweetener, applesauce, vanilla, and melted chocolate. In a separate bowl, mix together the flour, cocoa powder, baking soda, baking powder, and salt. Add the mixture to the wet ingredients, one half at a time, and beat until no large lumps remain. Remove the pan from the oven and let the cake completely cool before frosting. Put the boiling water and cocoa powder in a blender. Blend on high speed for about 30 seconds, or until the mixture is relatively smooth. Scrape down the sides of the blender. Be careful not to let steam build up. Add the dates, brown rice syrup, and salt to the blender. Blend until smooth, stopping occasionally to scrape down the sides of the blender with a spatula to make sure all the ingredients are incorporated. Add the vanilla and blend until combined. Transfer the mixture to an airtight container. Let chill completely, for at least 3 hours, until it becomes firm and spreadable. I may never be the “Queen of Vegan Cooking”, but I have found that there are tasty vegan recipes out there and I know that they are healthier than some of the more traditional non-vegan foods. Being healthy doesn’t have to be dramatic, it can be as simple as adding one healthy behavior (recipe, exercise, etc.) at a time – and of course, you leave room occasionally in your new lifestyle for a little fudge!